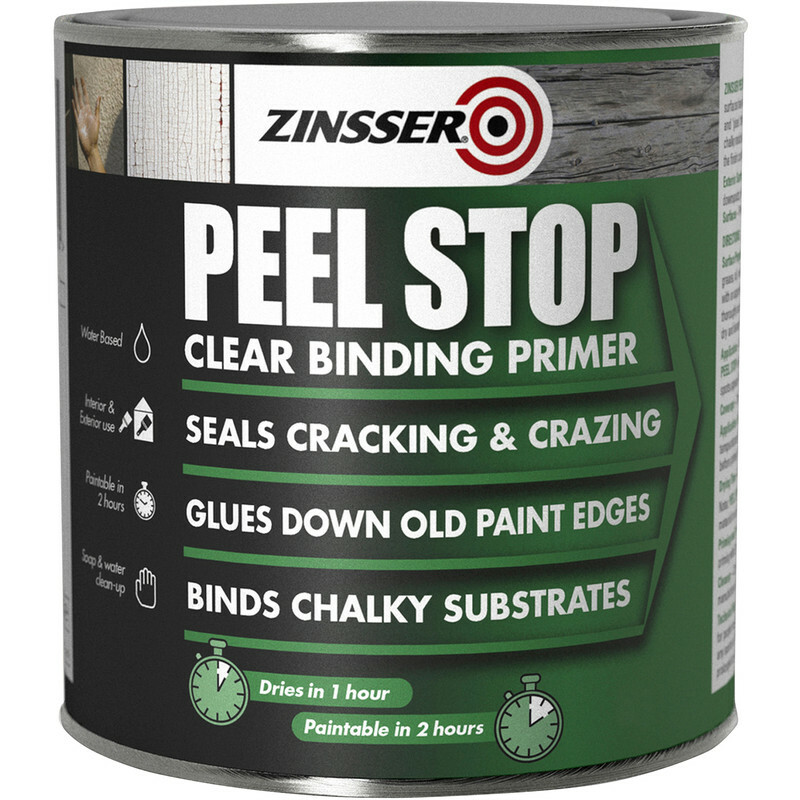 Zinsser Peel Stop Primer Paint Clear 2.5L is rated 3.5 out of 5 by 8. Rated 2 out of 5 by Bathroom Guy from Not as good as it's made out to be I had/still have serious peeling on a bathroom wall. The bathroom had been painted in cheap Magnolia non-bathroom paint, and I decided to paint over it with proper white bathroom paint. Bad idea - the paint just keep peeling in a few places. Having read some online reviews, I then went and bought this Zinsser Peel Stop to try and fix the problem. This product is a sort of undercoat primer/glue, which glues the edges of underlying paint down, creating a new paintable layer on top. Sounds good, and it works to a limited extent, but I found I needed lots and lots of layers of the stuff. There is plenty in the can, but the problem is time. Each layer needs a lot of time to dry out. The stuff is very thin and runny - almost like water. It took me about 6 or 7 layers before I got a paintable primer layer down - previous attempt after just 2 layers failed miserably as the peel came back. I then painted over this with the white bathroom paint. As I did so, I couldn't help but notice that the underlying Zinsser coat was NOT firm! Very iffy, but it could be made to sort of work in the end. Rated 4 out of 5 by Fruit from It worked We had a small area of freshly plastered wall and the first mist coat was perfect apart from one small area where the emulsion would just not bond. Peel stop sorted it. Expensive considering we only used a teaspoons worth out of the tin though! Rated 5 out of 5 by Meester Chris from Used on a 100 year old train carriage Used on a Victorian train carriage which has a constant issue with peeling paint, sanded down and filled, the Peel Stop goes on quickly @nd smoothly using a 4” brush. Finished with custom mixed chocolate brown gloss paint, it looks really good. Now we’ll see if the paint coat remains intact. Easy to apply, fast to dry. Rated 1 out of 5 by Leonard from okay for job tin was badly dented, and slight leakage. Fortunately the contents were in a vacuum sealed bag. Rated 5 out of 5 by Dwg_P from Campervan table We wanted to add a new surfboard shape table in the campervan. Of course being a 'spontaneous' action we wanted the bits quickly. That's where Toolstation is superb. Ordered online, turned up 15 mins later in the store - all there waiting. This varnish was the muts ! Rated 1 out of 5 by milburys from not fit for purpose Maybe I was just unlucky. Followed the instructions but when trying to apply a coat of emulsion after the application of peel stop had dried the existing paint just flaked off.